Geetanjali Bhalla, an inspiring and forward-thinking person, is an ideal head at the London MahaVastu Centre. She has been instrumental in directing the MahaVastu centre towards imbibing the dream and ideology of Guru Sakha Khushdeep and taking his modern Vastu teaching forward in this part of the world. 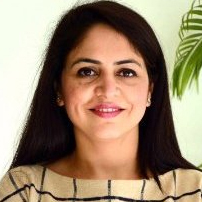 Ms. Bhalla was born on February 26, 1979 in Delhi to an agriculturist and a head teacher. Her modest beginnings notwithstanding, she received the best of education and went on to become an Interior designer by profession. Her rural roots find expression in her appreciation for organic forms that reflect in her visualisation and designing skills. Ms. Bhalla’s love for home designing transcended beyond being a hobby when she took it up professionally. This zeal led her to set up a very successful interior design consultancy firm in UK, where she moved post her marriage with Mr. Satyan Bhalla, a barefoot traveller. In no time, she became a household name in the field of interior designing and was regularly invited to address budding design students. A series of fateful coincidences led to her meeting with Guru Sakha Khushdeep with whom she began her journey in Mahavastu. As a qualified Vastu Acharya, Ms. Bhalla believes that built-up spaces should be both beautiful and fruitful. With her impeccable eye for design and a keen sense of applying Vastu for generating positivity, she is one of the most experienced and competent MahaVastu Experts in the UK. She has over 100 successful case studies that are a testimony to her calibre. Besides the UK, Ms. Bhalla has undertaken successful Vastu consultations in the Middle East, Nigeria and South Africa as well. Being an entrepreneur with a scientific bent of mind, she has been spearheading the cause of removing the misconceptions about Vastu that have been prevalent in the modern society. The teachings of her Guru, Guru Sakha Khushdeep, have had a tremendous impact on her life. Through MahaVastu, she has been working towards bringing a positive change in the lives of other people as well.